Techpeditie, smart technologies in an adventurous exhibition. Nowadays, we hardly give any thought to the fact that the innovative technology developed for the industry has gradually seeped into our everyday lives and has made things more convenient for us. Also, the fact that there are so many bright minds continually engaged in developing this technology is something that completely escapes us. This is something that Imec wanted to change through the Techpeditie. The Techpeditie is an interactive, travelling pop-up exhibition that introduces Imec’s latest technological innovations to the public at large. The Techpeditie travelled throughout Flanders from May to October 2018, stopping in 13 different cities. Because technology is often considered to be dry and complex, Imec wanted to make the Techpeditie not only informative, but also fun and interactive. The Techpeditie introduced the public to the complexity of technological innovations in a playful and accessible manner, via gamification. To bring this element of play into the exhibition, Imec engaged Cartamundi Digital. In a mobile construction formed by a number of containers, there are modules in which technological innovations are displayed. Cartamundi Digital cooperated on the content of this setup, and also developed some of the modules. In the racing game developed by Cartamundi Digital, the visitor sits down in a smart car seat. You are asked to drive along a route as quickly as possible, while being confronted with unexpected events as you drive. The smart car seat measures your stress level, allowing you to discover just how immune or not you are to stress behind the wheel. Of course, robotisation is also a subject of the Techpeditie. 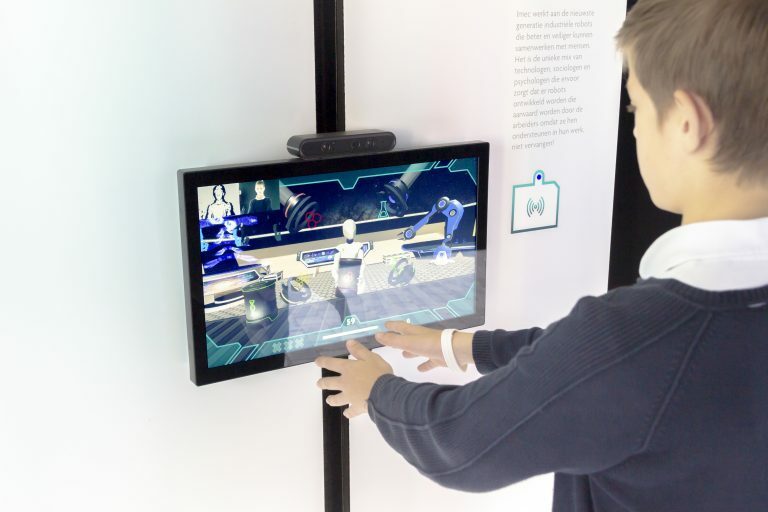 We developed an interactive game in which a robot on the screen addresses the visitors, asking them for assistance in moving heavy objects. Visitors could give the robot orders and make it sort objects through hand gestures. When setting up the integrated solar cells, we came up with a game concept in which two houses generate energy with solar cells. The players could press a button to blow away the clouds obstructing the sun towards their opponent to generate more energy. Once one of the two energy meters was full, a real washing machine was switched on. A hyperspectral camera (HSC) was also introduced during the Techpeditie through game play. In one of the games, for which we thought up the concept, visitors were asked to harvest crops that have ripened on the field. The players could find the right crops by operating a drone that flies over the fields. The HSC images were projected on a larger screen at the same time, allowing the player to distinguish between crops that were ripe and crops that were not ready to be harvested. Finally, Cartamundi Digital also developed a technology quiz for the Techpeditie website. After the exhibition, visitors were sent a link to the quiz via the newsletter and could test what they remembered from their visit. 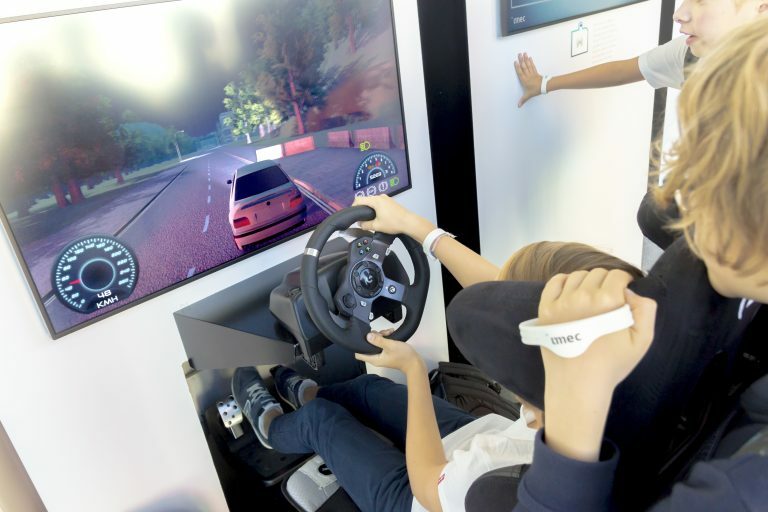 Cartamundi Digital thought up and developed digital games and digital simulations that introduced visitors to the Techpeditie to the latest technological innovations. Together with Imec and the audiovisual experts of Ocular, we also developed most modules in terms of content. The Techpeditie proved to be a successful mix of technology and gamification. Gamification often presents an ideal solution for explaining complex or serious content in an understandable and accessible manner to a wide public. Are you interested in finding out how Cartamundi Digital can do this for you? Don’t hesitate to contact us! © 2019 Cartamundi Digital. All rights reserved.